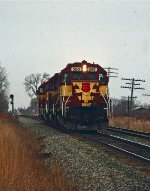 Description: Third unit on a westbound freight. Description: A westbound freight passes the wig-wags on Murdock Ave. Description: Train 20 heads for Shops Yard. 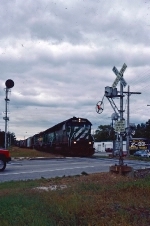 Description: An eastbound passenger extra fro Shawano arrives at the west end of the yard. Description: A passenger extra from Shawano arrives at the west end of the yard. Description: Waving good by to Sdl 39s. Great litle power wish emd made more like them.